You know, I was never really a fan of guacamole. I think it had something to do with going to dive taquerias (there are tons of them here in SF, both good and bad) and seeing the sheer amount of green being piled onto my plate that, in a sci-fi kind of way, looked like radioactive vomit devouring my food. But then I had a taste of real guacamole- specifically this guacamole, which comes from a dear friend’s family. The corn and diced vegetables add sweetness and texture, while the feta cheese makes for an even creamier mouth-feel, plus the occasional surprise tangy bite. After eating this familial twist on a classic Mexican staple, I take back my earlier words about radioactive vomit, and will gladly eat them ten-fold. That’s how amazing this guacamole is. Thank you, Tia Carmen! 1. Prepare the corn: bring a pot of water to a boil, then add the corn and cook until tender (about 3 -4 minutes). Remove from pot, let cool, then shave the kernels off the cobs and toss together with the tomatoes, onion, and jalapenos in a bowl. Set aside. 3. Add the corn mixture, feta cheese, and a desired amount of cilantro to the mashed avocados. Stir to combine. Season to taste with salt and pepper. Serve immediately. * To prepare this ahead of time, just prepare everything except the avocados. Mash them when ready to serve, otherwise they will turn brown from oxidation. 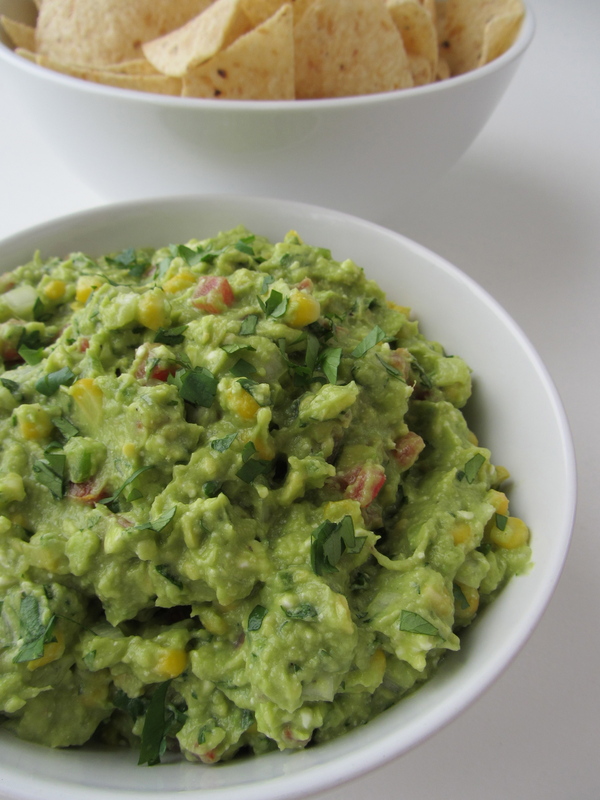 * Use soft, ripe avocados; hard ones are not creamy and will not mash. * The lemon juice not only adds a freshness of flavor, it also helps prevent oxidation.